notably Tracy Dahl and Mike Gerasimoff. US ITASE is effectively a polar research vessel. It offers the ground-based opportunities of traditional style traverse travel coupled with the modern technology of GPS, crevasse detecting radar, satellite communications and multi-disciplinary research. By operating as a ground-based transport system US ITASE offers scientists the opportunity to experience the dynamic environment they are studying. US ITASE also offers an important interactive venue for research (currently eight integrated science projects) similar to that afforded by oceanographic research vessels and large polar field camps, without the cost of the former or the lack of mobility of the latter. More importantly the combination of disciplines represented by US ITASE provides a unique, multi-dimensional (x, y, z and time) view of the ice sheet and its history. Ultimately, US ITASE will sample the physical and chemical environment over spatial scales in excess of 3000 km and up to 3000 m depth, over time periods of several hundred years (annual scale) to hundreds of thousands of years ( millennial scale). While initial set-up for US ITASE season 1 required several C-130 flights (eg., a single flight per major oversnow vehicle) US ITASE seasons 2-4 can operate in future years with minimal put-in (1-2 flights), fuel resupply (1 flight) and take-out (1-2 flights), similar to small single discipline projects. Furthermore, US ITASE can continue to travel over the ice sheet under conditions that would not be suitable for aircraft operations, because of GPS and ground-based crevasse detection capabilities. The “99-’00 austral summer field season was the first season for US ITASE operations. Despite unavoidable delays in weather that resulted in a loss of approximately half of the US ITASE 1 field season, two-thirds of the science was completed. Realizing time limitations, US ITASE 1 chose to undertake the traverse leg from Byrd Surface Camp to Swithinbank AWS because this leg would not have been feasible to include in plans for US ITASE 2 without a major detour. The portion of US ITASE 1 not accomplished in ’99-‘00 (a traverse leg to the proposed inland WAIS deep drilling site) will be undertaken next season through some adjustment to the traverse route during US ITASE 2. Because a multi-disciplinary oversnow traverse is a relatively complicated process US ITASE 1 served as an important test case for future traverses. While the ideas presented below do not guarantee perfect US ITASE seasons in the future, they are intended to be an important step in the evolution of research style oversnow traverse capability. Several discussion items follow. They represent the combined thoughts of the members of the US ITASE 1 traverse. They are offered as a starting point for discussions with OPP/NSF and ASA which we hope can be initiated in winter 99/00 to allow sufficient lead time for the 00-01 season. During US ITASE1 we had two 1990 vintage, refurbished Tucker Sno-Cats (nicknamed Ellie May and Jethro). By season’s end the vehicles had traversed in excess of 450 km, with each towing close to their maximum limit of 20,000 lbs. The Tuckers consumed approximately 1 gal/km moving over nearly flat, almost sastrugi-free terrain. They performed extremely well, although at their pulling limit. Traverse speed was 6-7 km/hr. Typical travel legs were 90 km. With relatively short stops at waypoints (spaced approximately at 10 km intervals) travel times were on the order of 15-18 hours between stations. 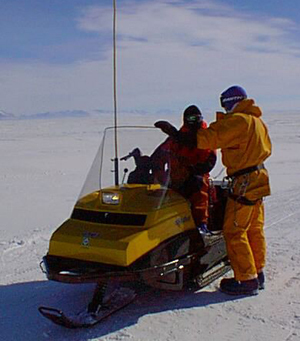 While slow and long these trips provided excellent opportunities for the acquisition of high quality snow/ice penetrating radar profiles at a variety of frequencies including that required for crevasse detection. The appearance of a Caterpillar Challenger 55 by the ’00-’01 season and possibly a second for the ‘01-’02 season will certainly allow transport of significantly heavier loads. This increased towing capacity should allow the weight-limiting components from the US ITASE 1 season to be overcome (suggestions below). The only negative aspects of adding a different type of vehicle to the traverse are the necessity to carry two sets of spare parts and of finding a mechanic familiar with both Tuckers and Challengers. The addition of extra spare parts is significantly outweighed by the added pulling power. Assuming Tracy Dahl is willing to return for US ITASE 2 we would suggest that he be sent to a short course in Challenger repair to allow him to continue as mechanic. He did an excellent job of maintaining all of the vehicles, sleds and equipment while also being available for science activities as a Tucker driver. One concern we have with the Challenger 55 currently enroute to Antarctica is the fact that the cab is only designed for one driver. In the interest of safety it would be preferable to have this cab modified to accommodate at least one passenger. Since the cab has to be removed during C-130 transport to the field this modification should be considered as part of this process. If it is not possible to make this modification (as suggested during our out brief 17 Dec 1999 in McMurdo) then we would hope that thew Challenger 55 and other vehicles could be equipped with a communications system. Unfortunately typical VHF communications are not possible because they interfere with radar data collection. Hard-wired communication systems might be the answer but further work is needed to develop such a system. During US ITASE 2 we plan to use the Challenger 55 for pulling the majority of the traverse load and we plan to continue to use the radar-fitted Tucker (Ellie May) as a research vehicle (notably for radar profiling and crevasse detection) pulling a relatively minimal load. We estimate that the combination of loading the Challenger and under loading the Tucker might result in both operating at speeds of 10+ km/hr, an improvement over the ’99-’00 season. The increased pulling capacity and attendant horsepower of the Challenger may have a downside. Estimates for Challenger fuel consumption under load suggest that these vehicles could be hapf as fuel efficient as the Tiucker SnoCats. If correct this changes significantly the fuel requirements for each field season. To address this issue and lighten loads in general we have suggested below that future US ITASE seasons include C-130 air drops for fuel. Preliminary discussions with VXE-6 concerning fueld drops have been very positive. We also suggest that the second Tucker (Jethro) stay at Byrd Surface Camp as a back-up vehicle for US ITASE 2 and as a camp support vehicle. Runway grooming at Byrd would be greatly facilitated by the availability of this Tucker. US ITASE 1 was fortunate to have two new Berco sleds. 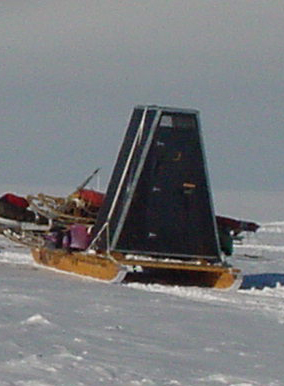 One was used as a fuel/equipment sled and the other as a freezer for housing ice cores plus roof storage for a variety of equipment. These sleds performed extremely well. However, an eclectic combination of other sleds followed the Berco sleds. As discussed below some plowed through the snow, others like the Maudheim did extremely well. We strongly urge that two additional Berco sleds be purchased, one for the’00-’01 and one for the ‘01-‘02 season. This would provide optimal load carrying capability and tracks made by a lead Berco would provide an advantage to following Bercos. The two new Berco sleds would replace the Polar Haven galley and science facility used in ’99-’00. The Polar Havens proved sufficient for limited travel and were required for weight saving in ’99-’00 but they have several flaws. They are fitted on low-lying runners that plow into snow on traverse. The significantly rougher conditions expected in future years would make these sleds even more effective plows, if not anchors, severely limiting overall load capacity. While comfortable the Polar Havens do not afford the insulation, sound proofing, or winter-over storage capacity of more permanent structures discussed below. Furthermore, Polar Havens require construction and destruction each season. The US ITASE 1 team was made up of eleven members. The size of the team required a galley type facility and the extensive use of electronics and data processing required a science facility. While not spacious, the Polar Havens (12’ x 16’) provided reasonable space for both operations. They are not, however, suitable under more extreme conditions than those encountered in ‘99 – ‘00. We suggest that for US ITASE 2 the science facility be mounted on a new Berco sleds and for the following season that the galley be mounted on a Berco sled. More permanent facilities and possibly larger (extending 2’ on either side of the Bercos) could be constructed at a reasonable cost by utilizing 2" stress skin panels, fiberglass or aluminum milvans or tomato-type structures. These structures should survive the rougher terrain and longer traverses expected in future seasons. Minimal extra interior furnishing beyond that already built for the Polar Havens would be needed. With proper design the entire traverse team could be berthed in these structures. While many might prefer tent living while on station for 2-5 days, oversnow travel is extremely slow and having ready berthing for rest stops (and/or for some to rest while others drive) would improve morale, safety and travel efficiency, particularly during US ITASE seasons spent on the interior plateau. The science Berco could provide berthing (when needed) for up to nine people if fitted with triple high bunks, arranged three head to foot on one side of a milvan. The other side of the science Berco could be fitted for computer work and equipment repair by installing a fixed work table to the wall and a fixed bench for seating. Removable tables used in ‘99-’00 were satisfactory but wasted space and required stowage. The berthing side of this milvan could be fitted so that lower bunks convert to seating and upper bunks fold away for headroom. The science Berco could potentially seat all team members and act as a combination work/rest area. The galley Berco could provide bunk berthing for up to six individuals in addition to serving as a kitchen/eating area. Both Bercos should have interior strap downs to secure items during traverse. Minimal storage for heavy outerwear in both Bercos would free up considerable living/working space. The permanent structures we suggest provide year round storage needed for US ITASE wintering of equipment in the field, additional roof storage, more permanent and safer propane and electric hook up plus surfaces for mounting features such as snow melters and PV (photo voltaic) systems discussed below. In addition such structures do not require set-up, removal and storage each season, thus providing a significant savings in labor and wear and tear on the structures. Assuming a solid structure for both the galley and science facility for US ITASE, two (2) 1000-watt (12-24 volt) banks of PV cells could be placed on the roofs. These systems would each require ten (10) 100-amp-hour batteries (650lbs) for power storage. Vehicle alternators could be integrated into the system to supplement charging while underway. Tucker Ellie May currently has such a system which has proven extremely valuable to the radar group. Outlet boxes should be built into the sides of the rigid galley and science facility. Propane was used for galley and science facility heating plus cooking. The system worked very well. However, the storage boxes built for the propane cylinders weighed 450 lbs and although painted black on the outside, were insulated on the inside (forcing them to cool passively). We have some reservations about use of propane in future seasons as US ITASE moves into regions below –40 deg . For efficiency we suggest that liquid fuel be investigated as a heating and cooking source to reduce the mixture of fuels needed each season. White gas Coleman and MSR stove back up was also available. White gas is, however, highly flammable and should only be considered as a back-up fuel source. The 100 amp hour batteries supplied for US ITASE 1 were far superior to the sealed lead acetate batteries formerly available. Four Alpine II snowmobiles were allocated to US ITASE. Only two were taken on the traverse to save on Mogas loads and to avoid having four people drive alongside the Tucker traverse. We plan to use three to four snowmobiles in the future to allow side trips and assist with camp activities. However, we suggest that most or all of these snowmobiles be transported on sleds during the traverse legs between stations to save on fuel and on driver fatigue. With the improved pulling power of the Challenger 55 this may be possible. Four Nansen sleds for snowmobile work. One Maudheim for the ice drill and ice core sampling equipment. Two Maudheims to carry snowmobiles. One Komatik for the mechanic. For the first time ever a field transportable ice core storage unit was available. The “PITA box” provided an excellent storage container for ice core boxes. During US ITASE 1 it was subjected to most probably the warmest conditions expected over the four years of US ITASE. Temperatures rose as high as 0 degrees C during US ITASE 1 for several hours at a time. More typical temperatures were –5 degrees C. The system does not contain an active cooling system and as such cannot maintain temperatures below ambient for longer than that sustained passively by the thermal mass of ice in the freezer. It would be worth considering an active cooling add-on to the current system to avoid having to bury ice cores if air temperatures rise above –10 degrees C. If US ITASE collects ice cores for gas analysis –15 degrees C should be maintained. Several add-on active cooling systems might suit the purpose. One would include a standard freezer compressor unit mounted on the freezer box, as commercially used on “reefer” trucklines. This could amount to 500 lbs. Two Herman Nelson heaters – these are essential for starting heavy vehicles and a variety of camp activities. Only one functional Herman Nelson was available for US ITASE 1. Chain saw for camp activities. Water melter – the system worked well but was too large to keep in the Polar Haven galley. With a rigidly structured galley, the water melter could be attached to the outside of the structure and water tapped into the galley. This would allow easier filling and less interior mess. Another possibility might include the production of water from snow melted off the Tucker or Challenger excess heat. This system would help to cool the vehicles’ automatic transmissions, thus increasing their ability to handle maximum loads. US ITASE was provided with a new lightweight drill designed by Icefield Instruments, Inc. 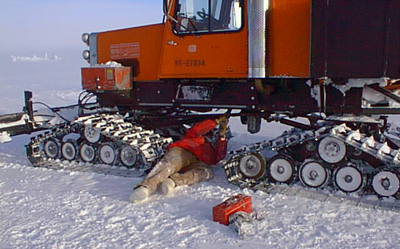 The drill was mounted on a Maudheim sled and transported as a field ready unit, contrary to normal procedures that require drill set up at each site. The drill traveled well and produced high quality 82 mm ice cores. Two minor breakdowns did occur due to broken electrical connections. Both were fixed in the field. We suggest that it would be prudent to continue to employ Michael Gerasimoff, Icefield Instruments, a co-designer and builder of the drill, to assure efficient, high quality operation. We used a toilet mounted on a sled during US ITASE 1. It was very luxurious compared to our previous experience. The system worked very well although the low clearance on the runners could produce problems on traverses with less level terrain. An ideal solution would be the same system lifted a few inches higher above the snow surface through higher runners. US ITASE 1 was issued 4 PRC 1099s and two VHF radios. Eight Iridium phones were donated through a grant to US ITASE and the Museum of Science (Boston) by Motorola Iridium for use in the field. We used these phones for daily check-in with Byrd Surface Camp, daily updates sent to the Museum of Science (Boston) as part of the US ITASE outreach program, contacting PI’s not in the field to trouble check equipment sent by them into the field, and minimal personal use. The Iridium system worked perfectly, and provided significantly more clarity and reliability than HF radios. During US ITASE 1 the team was comprised of a field leader (glaciochemist), associate leader, mechanic, ice-core driller, safety officer, three radar researchers, one surface glaciologist and two graduate students (one worked on a US ITASE PhD project) for a total of eleven. A total of 4.5 days per station were devoted to completing science tasks. All of the individuals were occupied while on station and during travel four acted as drivers for the Tuckers and two on snowmobiles while three conducted science experiments. Thus the addition of any new tasking at stations (above the eight projects currently funded) will require additional spaces on the traverse. Assuming the correct individual can be found, we suggest that the Safety Officer also take on the task of overseeing day to day camp duties (eg., cooking/cleaning duties, camp set-up, check-in and check-out of snowmobile parties). Although not hired explicitly for this purpose our current Safety Officer (Kevin Pusey) functioned to a large degree in this capacity while also acting as Safety Officer and assisting with science projects. He did an excellent job and we hope he will return. Challenger 55 followed by fuel Berco, new science Berco and Maudeheims carrying snowmobiles and ice core drill plus Nansen sleds. Tucker followed by freezer Berco, galley Polar Haven and toilet. The galley Polar Haven would change to a galley Berco in ‘01-’02 if a second Challenger 55 is available at that time. In order to minimize wear on the traverse vehicles and maximize non-fuel cargo availability we suggest that one C-130 fuel resupply or several Twin Otter fuel resupply flights be staged either immediately prior to the ’00-’01 traverse or during the traverse. C-130 support would be preferable since it could allow for 3-4 airdops of 12+ fuel barrels during one resupply flight. We would propose to transfer this fuel into a bladder mounted on our fuel Berco. Addition of a gas powered pumping system would facilitate the transfer and prevent lifting drums out of the impact craters produced during the air drop process. Expended drums would be cut, crushed and stored on the fuel Berco. Research strategies will be streamlined where possible for future years in order to minimize on station time. US ITASE researchers plan to meet in winter ’00 to discuss options and develop a plan. Several aspects of US ITASE could be expanded upon if new proposals are funded. However, if the US ITASE 1 operation style is maintained it will not be possible to accommodate many new types of programs and even under the US ITASE 2 style of operations there may be limitations. Additions to existing programs such as ice coring, snowpit study, radar and surface glaciology are all possible. Limitations will always exist in the amount of core that can be transported and maintained at temperature. If, for example, duplicate cores are required at sites this will reduce the spatial coverage, which is a mainstay of the science program. Such a request could be accommodated by caching ice cores for pick up by C-130 or Twin Otter, although not without potential complications. Requests for additional space in the science facility should be carefully considered. Under both the US ITASE 1 and 2 styles of operation space is at a minimum and it is not clear that any fully dedicated space can be guaranteed. The understanding thus far is that all science space is shared. Multiple usage should also be carefully considered. It is not clear that the science facility is suitable for chemical analyses (because of contamination, size and the possible necessity for plumbing), although this would clearly be an advantage over transporting all ice cores. Additional science requests requiring facilities above and beyond US ITASE 2 style operations will probably require changes to structures, additional fuel and additional time on site. During the US ITASE 1 field season the field team participated in several outreach activities. These included: a Sunday lecture in McMurdo (PM), news article for Antarctic Sun (PM), biweekly live interviews with Musem of Science via Iridium phone 6 November to 15 December (entire team), interviews with grade schools via Iridium (GH, BY), National Public Radio via Iridium (PM, TC) and the Portsmouth Herald (PM, JS). A high resolution 400-MHz profile to at least 50 m depth was acquired along the entire 185 km traverse from the Byrd to the Swithinbank core site. Thus three core sites were traversed. This depth is based on an average firn density of 0.7, exceeds the expected 40 m range we stated in our proposal, and may be even deeper depending on core density studies. The resolution includes sufficient trace sampling to interpret radar pulse phase changes. Major layers that could be followed for at least 20-30 km and possibly more exist at about 30-50 m depth. Their disposition appears to deepen as much as 20 m over distances on the order of 10 km, and some major horizons dip off the record and then reappear. There appears to be very interesting folding, but a true structural analysis will await topographic corrections from the simultaneously recorded GPS data. All strata appear surface conformable, as they should in an accumulation area, but firn thickness between any two horizons can vary by several meters depending on location along the profile. Experimental 400-MHz profiles were acquired at longer time ranges, and faint, dipping horizons were detected to about 75 m depth. However, waveform sampling was inadequate for the large time range needed for these profiles and so we chose the lesser range of 50 m to give higher quality data, yet cover almost all, or more, of the core depths. 3-4 km profiles were acquired in orthogonal directions about the Byrd, Midpoint, and Swithinbank core sites. The profiles appear to show local horizontal layering in the vicinity of each site. Experimental profiles were acquired using an FM-CW radar at L-Band (1.1-1.8 GHz) and at X-Band (8.2-10.4 GHz), simultaneously with many of the 400-MHz core site profiles. This radar system offers increased resolution, but penetration was not clear at the outset because of the very high frequencies. The results show that the L-Band radar penetrated to at least 40 m depth, but the strata do not appear continuous either because of the local discontinuities in the layers,to which the narrow beamwidth antennas could be sensitive, or because of processing problems. The X-Band data show near-surface horizons more clearly, and to a depth of at least 8 m. This is an important result because it demonstrates that recently acquired X-Band Radarsat images of crevasses in West Antarctica could very likely be images of hidden crevasses. No crevasses were detected along the entire route. Our 400-MHz antenna was mounted 6 m in front of the lead Tucker Sno-Cat specifically for this purpose. This result confirms the Radarsat images of this section of West Antarctica. Our immediate priority is to process the entire 185 km profile with distance normalization (to account for changes in profiling speed), but without topographic corrections in order to look at horizon continuity. We will then include topographic changes once we have acquired the GPS data. Finally, we will establish core stratigraphic correlations when the core results are obtained. We intend to make a large presentation of the profile for use by the Boston MOS. During the 1999 US ITASE season common ice cores and snowpits were collected for the following projects: University of New Hampshire (major anions, cations and MS), University of Arizona (reversible ionic species), CRREL (permeability and firn structure), University of Pennsylvania and University of Colorado (stable isotopes), University of Maryland and NASA (snowpit stratigraphy). 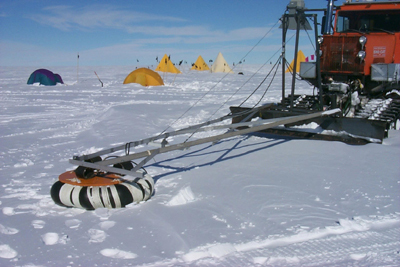 At both the 91 km and 183 sites (bearing 220 degrees from Byrd Surface Camp) both ice cores and snowpits were recovered for the common use of the research teams noted above. At both sites 2 m deep snowpits were excavated and sampled at 2 cm resolution for major anions, cations, MS, reversible ionic species (eg., H2O2 and selected organic acids) and stable isotopes. Permeameter measurements were made at 20 cm intervals. Back light stratigraphy was photographed and described. 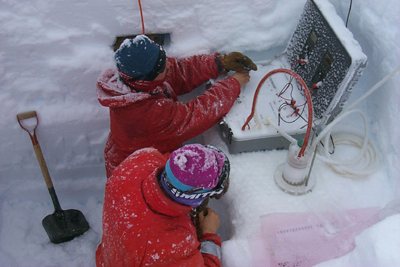 Snow density and accompanying stable isotope sampling was conducted at 2 cm intervals. Ice cores were recovered at both the 91 km and 183 km sites, to depths of 57 m and 47 m, respectively (tentative age at both sites 400-500 years). The ice cores will be sectionned at NICL and analyzed for major anions, cations, MS, reversible species and stable isotopes. Additional 15 m deep ice cores were collected for CRREL permeability and ice strructure stdies at both the 91 km and 183 km sites. At Byrd Surface Camp an additional 2 m snowpit was excavated at 2 cm sample resolution close to the Byrd AWS. This pit updates a previous snowpit excavated at this site in 1995. Accomplishments of the US ITASE 1 ice core and snowpit sampling program. Snowpits samples have now been collected adjacent to two AWS sites, Byrd and Swithinbank, affording the oppportunity to calibrate the records from these snowpits with instrumented meteorological data. Previous calibration of the pre-1995 Byrd AWS and snowpit demonstrated strong associations between ice chemistry and major atmospheric circulation systems. Ice cores collected during US ITASE 1 and in 1995 at Byrd will be used to help determine which physical and chemical parameters control major radar relectors. The penetration of three 50-60 m deep ice cores into the high resolution radar array developed by Arcone and Yankielun represents a unique opportunity to define depth-age scales for major radar reflectors. If accomplished the results will extend dramatically the spatial understanding of accumulation rate change and ice dynamics. Based on experience gained this season future US ITASE coring sites will be chosen with a detailed understanding of sub-surface ice structure. 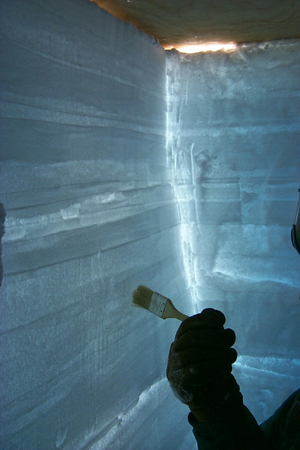 As a consequence one of the major unkowns in ice coring can be removed (ice dynamics and topographic influences) allowing more unique descriptions of climate change. Our field work this season met with mixed success, and in a number of ways we were fortunate to be able to operate in a 'shake-down' mode with somewhat limited objectives brought about by the weather and logistics delays which shortened our time in the field. This season I deployed a new radar receiver based on a 12 bit, 100 MHz digitizer board mounted directly on the PCI bus of an industrial-grade PC. I also used a new prototype transmitter being developed at the University of Washington. Field tests of our receiver system in July of 1999 showed greatly enhanced signal to noise and overall system gain in comparison to the radar we used on Siple Dome in 1996-97 so I had high expectations for its performance. Unfortunately, my minimalist concept for housing the radar (a Nansen Sled modified with a lexan 'bubble' for the driver) was totally inadequate for the weather conditions we encountered this season at Byrd. The more sophisticated electronics in this system evidently require a much more stable temperature and vibration environment, and it never worked properly. Fortunately, I brought along the old system as a back up, and was able to collect data when weather conditions allowed. Using the old system mounted on a Nansen sled, I completed a grid survey of the Swithinbank core site, and from this I expect to produce a map of the surface and bed topography, and to map one or more of the deep internal layers. The radar gave intermittent returns from the bed at approximately 1610 meters ice thickness at this site, indicating the need for a system with better overall gain and improved signal to noise, if the bed is to be mapped at future ITASE core sites. Thus there is a clear need to find a better way to deploy the new system as I describe below. At both Mid Camp and Byrd I also deployed the back-up radar in a static configuration and obtained clear echoes which appear to arise from the bed in the vicinity of 1600 meters ice thickness. These values (especially at Byrd) seem too shallow, and lead me to suspect the possibility of electronic artifacts in the prototype transmitter. Until I can check the results I am reluctant to claim success for these measurements. This season I also deployed the old system mounted in one of the Polar Havens during our traverse route from Mid Camp to Swithinbank. However, because of all the metal in the near field of the antennas the data show a significant amount of interference (ringing), and it is not clear if they will be of much use for mapping. Further processing may reveal some useable information. The lesson from this is that during the traverse, the radar must be deployed from a non-metal structure at some distance from metal objects in the train. On the return trip I set up the radar on a Nansen Sled at the rear of the train in hopes of obtaining records from the complete traverse, but the sled would not track behind the larger sleds and it tipped over repeatedly, self-destructing not long after we left the Swithinbank camp. I have had a number of conversations with our mechanic Tracy Dahl, one of the carpenters and other team members about how best to mount the radar next year. At this time I anticipate asking for a modified Komatik sled, approximately 14 feet long with runners spaced approximately 6 feet apart. On this would be mounted a plywood base and some kind of fabric sheltering structure similar to the Polar Havens - absent metal poles. On the back would be a generator for the electronics and propane bottle for a heater. The system would be weatherproof, yet light enough to be pulled by a skidoo for radar surveys at each core site, and would also be deployed at the end of the traverse train as we move from site to site. This configuration should meet our needs and would not be costly or difficult to build. install several combination AWS/firn compaction instruments. Objectives 1 through 3 were completed; objective 4 was not. GPS surveys of marker positions; resurveys in future years will provide their vertical and horizontal velocities. kinematic GPS surveys of local surface topography; the product of surface slope and horizontal velocity provides a small adjustment for vertical velocity due to along slope flow. measurements of firn core sample dimensions and sample recovery from 15 meter firn cores; the density profile will be used adjust for vertical motion due to firn compaction and also in the calculation of accumulation rate. The markers extend approximately 1.5 meters above the snow surface and need to be revisited within the next five years. Proper interpretation of ice core records requires an understanding of surface glaciological conditions surrounding ice core sites. Local fluctuations in accumulation rate are known to exist, and these are probably tied to variations in surface slope. At each of the ITASE core sites we measured ice speeds and local topography using static and kinematic GPS surveys. Both core sites are located in gently undulating topography typical of ice sheet interiors. Surface relief at the Midpoint site was approximately 20 meters over 5 km. Topography is more pronounced at the Swithinbank site with approximately 40 meters of elevation change over 5 km. Ice velocity data will enable us to determine where core strata of certain ages were deposited. The topography at these locations will assist in the interpretation of any accumulation rate variations that might be observed in the ice core records. GPS support was provided for other ITASE investigators. This included kinematic positioning for radar studies conducted by CRREL and St Olaf College. A base station was operated at Byrd Surface Camp for the duration of the traverse. Data were collected continuously, except for a 20 minute period just prior to our arrival at Byrd when power to the receiver was inadvertently disconnected. These data will be post-processed to obtain the precise position for the Byrd base station and subsequently the routes taken during the radar traverses. The major disappointment of the field season was the problems associated with RASCAL (Remote Autonomous System for Control of Altimetry)/AWS deployment. Unfortunately, 20’ lengths of 4” diameter aluminum pipe, intended to serve as instrument towers, and requested in the SIP were not obtained by ASA Science Construction. The mistake was not discovered until after deployment to McMurdo. No suitable alternative material was available on station. The process by which a replacement order for the material was placed seemed very inefficient and slow. The pipe arrived in McMurdo almost three weeks after the order was placed, by which time we had already deployed to the field. The lack of pipe may have influenced our decision not to traverse to the Divide sites, as originally planned. One suggestion for future seasons is that ASA deliver the RSP at least two months prior to the field season (this year it seemed closer to a month) and that the RSP is circulated among the PIs who are best able to discover missing items in time rectify mistakes. Also, ASA needs to change the way in which procurements from McMurdo are handled; this year it seemed that all requests were routed through Denver while actual purchases were made in New Zealand, and time zone differences served as a very effective brake on progress.